The Animator was smaller than its predecessor, ran on 4-AA batteries, and was housed in a light gray casing. Kids controlled the toy with two blue knobs used to move a flashing cursor around the screen, and eight red push buttons providing additional function: On/Move, Animate, Save, Draw, Next, Reverse, Recall, Erase. Through a combination of button pushing and knob turning, budding animators could create, erase, and move a series of 12 images, or “frames”, then animate these in a flip-book type storyboard. A built-in speaker provided rudimentary sound effects when the knobs were moved and during playback. The Animator’s onboard memory could store a maximum sequence of 96 frames, so kids with the creative patience and perseverance could change up the animation of their 12 frames. Ohio Art provided some sample animations to try with the toy, including The Walking Robot, The Nosy Spider, and my personal favorite, The Breakdancing Skeleton. The Etch A Sketch Animator was a huge hit for Christmas 1986, but soon faded in popularity, due in part to the amount of time it took to complete an animation. Ohio Art later released an updated version, the Etch A Sketch Animator 2000, that featured storage for 22 images, and plug-in personal game cartridges. 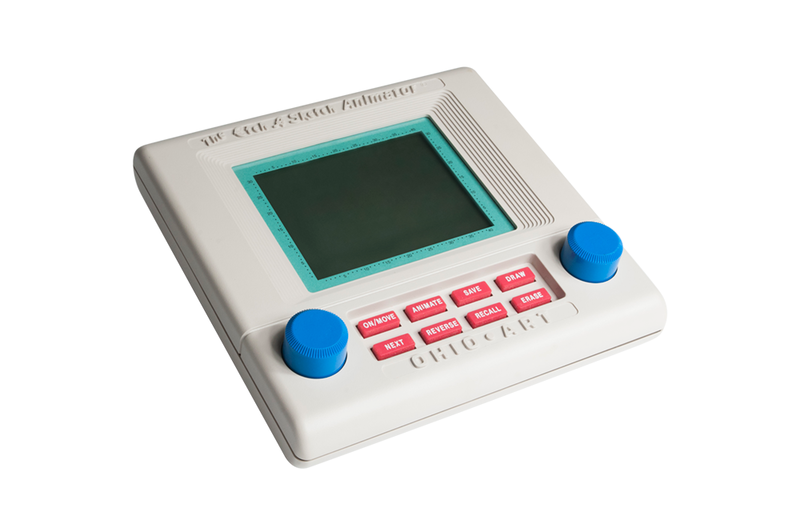 Known as the 2-XL Type 3 to collectors, the 1992 Tiger Electronics' version of the educational toy originally released by Mego in 1978 offered enhanced sound quality, and a technology upgrade. Released in 1966 by Topper Toys, the Suzy Homemaker Super Safety Oven was the company's answer to Kenner's Easy-Bake Oven.